The application shall be filed with the ICAB through the Central Authority (CA) on Inter-country Adoption or an ICAB accredited Foreign Adoption Agency (FAA) or Governmental Adoption Agency (GAA) in the country where the applicant resides. Relative Adoption as applies to inter-country adoption refers to the adoption of Filipino child/ren by relatives residing abroad within the fourth (4th) degree of consanguity. 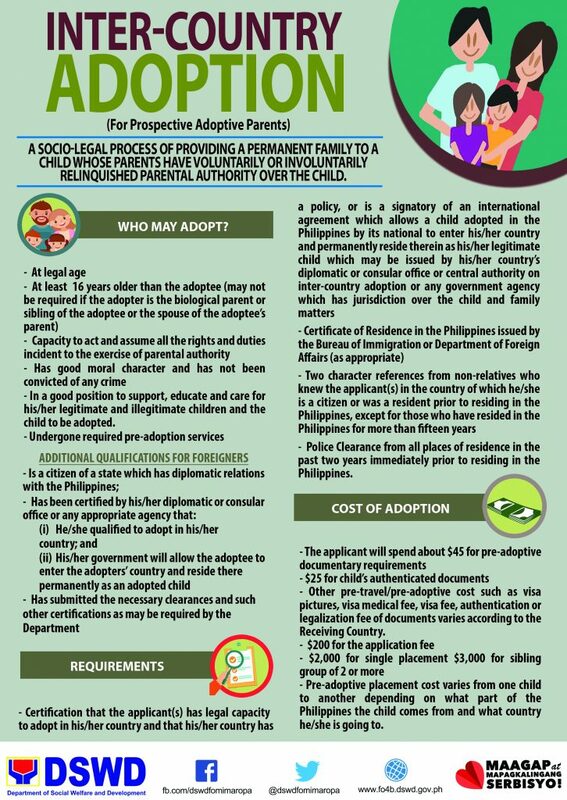 Former Filipinos permanently residing abroad and/or foreigners intending to undertake either local adoption (the filing and the finalization of the adoption is done in the Philippines and have the intention of bringing the adoptive child to their country of residence) or through the inter-country adoption route MUST first secure the approval from the Central Authority or appropriate government agencies before filing any adoption petition. Adoption applicants from the USA must first secure their suitability and eligibility to adopt (I800A) from the USA Central Authority on Inter-C-ountry Adoption. Canada based adoption applicants obtain such approval from the Central Authority on Inter-country Adoption of the Province or Territory of residence. The Questionnaire for Relative Adoptive Applicants (ICAB Form No.2) which can be downloaded from this website shall be submitted by the prospective adoptive parents (PAPs) to the Central Authorities (CAs)/ Foreign Adoption Agencies(FAAs). 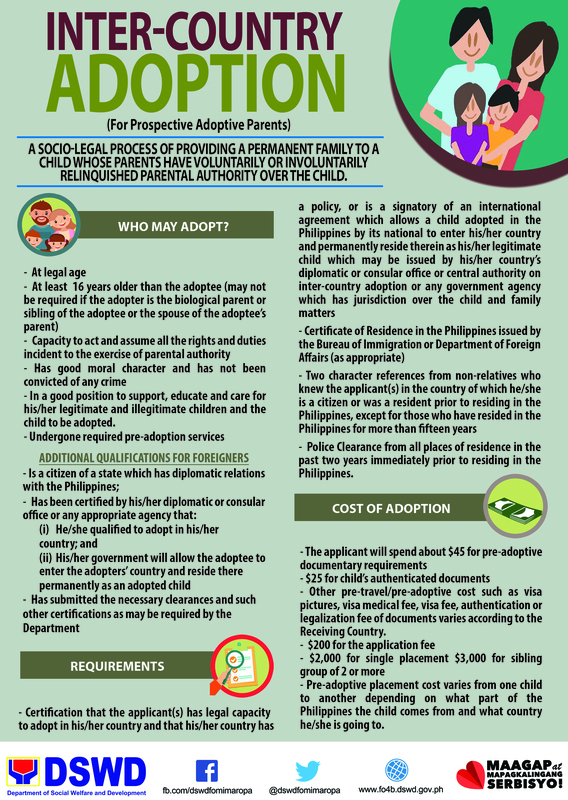 The CAs/FAAs shall endorse to ICAB the completed Questionnaire for Relative Adoptive Applicants (QRAA) with the agency’s assessment and recomendation on the prospective adoptive parents. If the CA/FAA favorably recommends the PAPs, the ICAB social worker will then request the CA/FAA to proceed with the preparation of the PAPs’ dossier. On the other hand, based on the significant data on the child as indicated in the QRAA, the assigned ICAB Social Worker will request the DSWD – Field Office (FO) to conduct the Child Study Report with supporting documents. Periodic follow-ups will be made with the DSWD-FO. (The time frame from request to ICAB’s receipt of the report will be 3-6 months. In sitautions where the FO could not prepare the Child Study Report within the expected time frame in view of heavy adoption caseload, the ICAB social worker will assist in the conduct of the CSR). Once the ICAB receives from the DSWD-FO the child’s dossier and the complete adoption application dossier of the PAPs from the CA or FAA, the ICAB social worker will prepare an executive summary on the case with his/her recommendation on the child’s adoptive placement for the disposition of the Board. The finalized Local Adoption cases requiring ICAB’s ratification has its own schedule of fees. The ICAB also supports the request of the Association of the Child Caring Agencies of the Philippines (ACCAP) to increase its Child Care Support Fund (CCSF) from US$ 500.00 to US$ 1,000.00 per placement. These new fees will not affect prospective adoptive parents whose adoption applications were received by the ICAB prior to February 2007 and are currently awaiting approvals and child proposals. This means that once these families receive a match, they will still pay the processing fee of US$ 900.00. All payments (except for the CCSF which shall be addressed to the child caring agency where the child came from) shall be in the form of a company check or international bank draft and shall be made payable to the Inter-country Adoption Board. Personal checks, travelers checks or cash WILL NOT be accepted. No adoption application will be processed and no Placement Authority will be issued unless the corresponding fees are received by the ICAB. Other pre-travel/pre-adoptive cost such as visa pictures, visa medical fee, visa fee, authentication or legalization fee of documents varies according to the Receiving Country. To inquire or follow-up with the ICAB, you can telephone, fax or e-mail:Phone: (632) 726-4568(632) 721-9781(632) 721-9782Fax: (632) 727-2026E-mail: adoption@icab.gov.